The same holds true for super single bed mattresses. When taken by its lonesome self, it would not do well against the forces of stress and fatigue. In order to have good sleep, your single mattress must be complemented with other accessories and sleeping implements. Let me share what I did with my single bed. I have already mentioned it in previous entries, and I still firmly believe that a metal bedframe would be best for any mattress. It is a blatant misconception for people to think that solid bed frames would mean a harder surface for your mattress, giving uncomfortable sleep. In truth, a quality mattress would ensure good sleep since bed frames only give support to the mattress that you lie on. A firm bed frame coupled with a comfortable single bed foam mattress will give you a comfortable and stable sleeping experience. Duvets, or comforters as they are more commonly known, would be a good addition to a single pocket sprung mattress set up because it acts as a blanket and bed cover. It is usually soft and made with down or feathers, or a combination of both, and it has the general appearance of a padded quilt. Out of habit, I sleep with my duvet every time despite being in the middle of winter or during the first of summer because I like the cozy feeling of sleeping under its soft padded material. It would also be advisable to include an orthopedic pillow in this set up because it is made out of memory foam which takes the shape of the weight of the object above it. An orthopedic pillow would give you the best neck support, providing a comfortable and healthy sleep. I love how I can always bury my head in orthopedic mattresses without worrying about waking up with kinks in my neck the next day. It might be worth mentioning, since we are on the topic, that if you do plan to buy a single bed mattress, make sure it is an orthopedic single mattress made from memory foam, similar to your orthopedic pillow. Orthopedic mattresses follow the curvature of your spine so that proper posture is maintained despite being fully asleep. It is the best single mattress in the market today and nothing will give you a better sleeping experience than a combination of all these products. I give you my word as an interior designer. 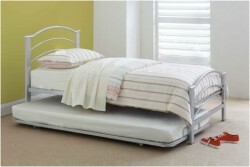 Do you have any other accessories in mind that would go well with a single bed and mattress? Leave your comments and suggestions below, and don’t forget to follow us on Twitter and like us on Facebook.